Hailed as the heir to Roald Dahl by The Spectator, the UK's #1 bestselling children's author, David Walliams, will have fans of Jeff Kinney and Rachel Renee Russell in stitches! David Walliams burst on to the American scene with his New York Times bestseller Demon Dentist, and no... read full description below. Hailed as the heir to Roald Dahl by The Spectator, the UK's #1 bestselling children's author, David Walliams, will have fans of Jeff Kinney and Rachel Renee Russell in stitches! 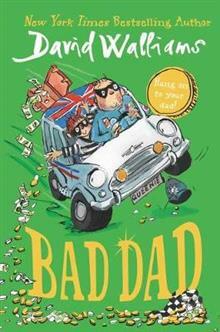 David Walliams burst on to the American scene with his New York Times bestseller Demon Dentist, and now he's bringing his signature humor to this raucous tale of prison breaks and heists gone wrong in Bad Dad. Frank's dad was a champion hot-rod racer, Gilbert the Great. But when a terrible accident sees him go from hero to zero, Frank and Gilbert are left with nothing--and in the grips of a wicked crime boss and his henchmen. After Gilbert is thrown in prison, only Frank can come to his rescue. . .
David Walliams is the New York Times bestselling author of Demon Dentist, The Midnight Gang, and Grandpa's Great Escape. His novels have sold over eighteen million copies worldwide and have been translated into over fifty-three languages. David's books have achieved unprecedented critical acclaim--with many reviewers comparing him to his all-time hero, Roald Dahl. In addition to being a bestselling author, David is an actor, comedian, and television personality. In 2017, he was awarded an OBE for services to charity and the arts. He lives in the UK. Tony Ross has illustrated many favorite books for children, including Lynne Reid Banks's Harry the Poisonous Centipede titles, the popular series about extra-terrestrial teacher Dr. Xargle by Jeanne Willis, and the Amber Brown books by Paula Danziger. Tony Ross lives in Cheshire, England.